Computer Age Management Services Pvt. Ltd. (CAMS) offers a comprehensive package of Transaction Processing and Customer Care services to the Mutual Fund industry in India.Currently CAMS provides this comprehensive package of services to 17 Indian Mutual Fund families as service provider. If you have invested in any of the mutual funds below then you can go to this website for all your service needs. In my opinion the most convenient is the "Mail Back Services" section which allow an investor to get a copy of their account statement , transaction details etc without having to remember the folio number. The investor has to enter the email address which is searched through the AMC's records for a match and then all associated folios are packaged together and sent encrypted to the registered email. 1) AMC Name :The first step is to choose the AMC(Asset Management Company) name. This is the name of the mutual fund that you have invested in. 2)Folio Number:Notice that the folio number is not mandatory. if an investor has multiple folio numbers under one AMC;by leaving the folio number blank, CAMS mails out a consolidated account statement for all the folios in that account. 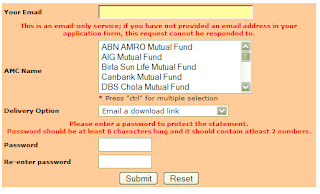 2)Registered email is required and it must be the same that has been specified when opening or servicing the account. This email address is the same where the account statement will be emailed. 3)Delivery Option: The account statement is delivered as an encrypted attachment OR as link to the CAMS server. 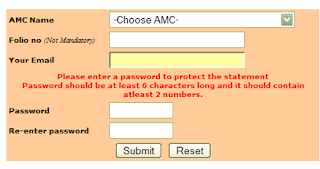 The latter requires you to enter the user id and password to view the account statement. This service provides the transaction history of an investor at an AMC as an excel sheet for reconciliation with an Accounting system. If you have a number of folios in many Mutual Funds,you can use this statement to get the most recent status of your aggregated Portfolio - including other products - emailed back on demand to your registered email address. The emailed Statement contains balances by security, Cost Value, Market Value, period of holding and return on investment. This statement provides your Investment Performance, Capital Gains and Income for the current and last Financial Years emailed back on demand to your registered email address. If you have registered an email id with your mutual fund investment, you can set the delivery of your account statement by email over here.